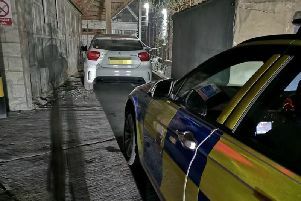 A boozed-fuelled man who was allegedly spotted by security staff punching a car window ignored warnings from police to leave the area before he was arrested for being drunk and disorderly. Chesterfield magistrates’ court heard on Friday, July 15, how Darren Marples, 47, of Green Farm Close, Chesterfield, had initially been spotted at the Tesco carpark at Lockoford Lane, Chesterfield, when he was approached by police. Prosecuting solicitor Sarah Haslam said the police were called by security staff after he had been seen allegedly punching a car window. She added: “He was unsteady and slurring his words and was not listening to officers and he made comments to a female officer. Marples, who has four previous convictions for being drunk and disorderly, pleaded guilty to being drunk and disorderly in public after the incident on June 30. Defence solicitor Felicity Coats said: “Police came to him and he knows the female officer and said, ‘let’s dance’. “He’s got mental health difficulties and he’s got a certain way of talking that people may not like but it’s not that he’s being rude. Magistrates fined Marples £120 and ordered him to pay £85 costs and a £30 victim surcharge.